Happy Saturday friends. 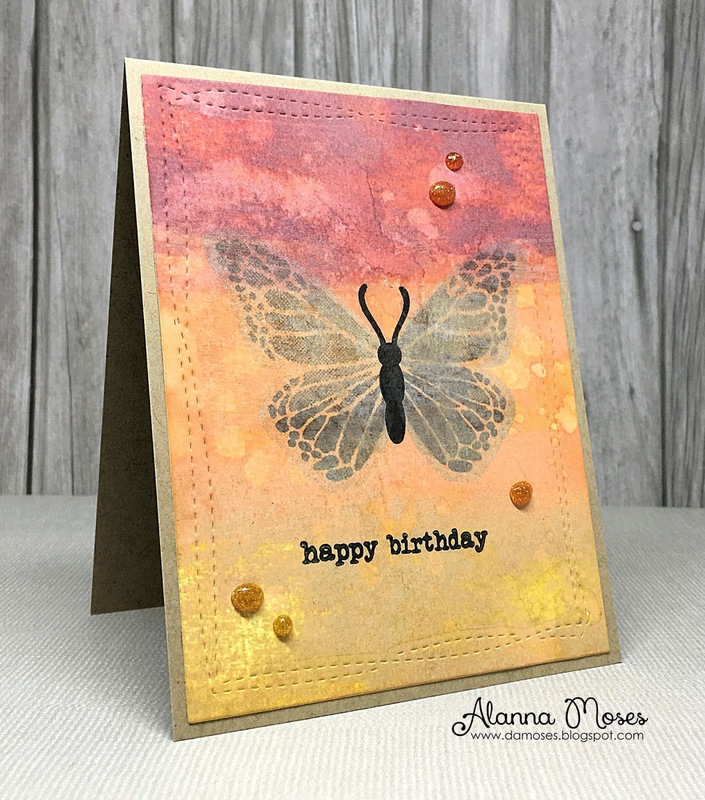 I had to pull out Concord & 9th's Butterfly Beauty set again and I have three cards to share with you today using that set for TupeloDesignsLLC. If you didn't see the first card I made with it, click here. For my first card, I started by doing some ink blending with some Picked Raspberry, Twisted Citron and Peacock Feathers Distress Inks. I used my Clarity Brushes to do this. I then added some water droplets to my card. 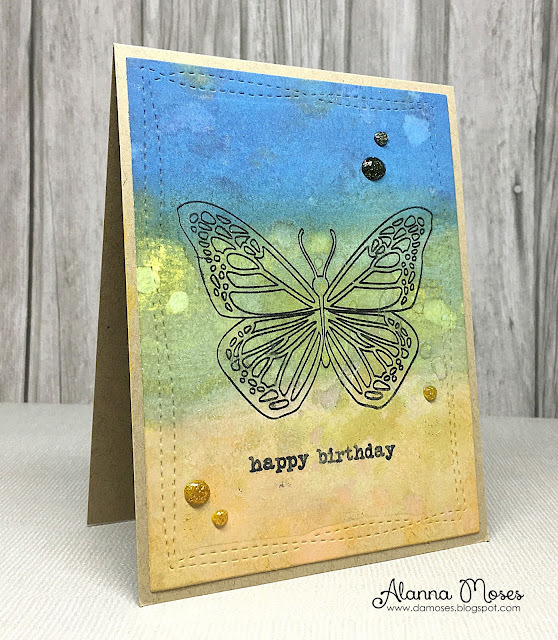 I then stamped the various layers of the butterfly from the Butterfly Beauty set three times onto my card. I cut down my panel a bit, added some MFT Black & White paper pack onto the side of the card base and then added my focal panel with some foam tape. Lastly, I added some Morning Dew Nuvo Crystal Drops. My next two cards are the same except for the colors I used. For both cards, I played around with my new Distress Oxide inks. TupeloDesignsLLC just got a large shipment of these inks in and as of right now, most are still in stock and they are on SALE! Click here to see all the Distress Oxide inks. For this card, I used Faded Jeans, Peeled Paint and Fossilized Amber. I applied the ink pads directly to my card panel for lots of color. I then sprayed the panel with lots of water to blend the colors a bit. I dried it with my heat gun and then spritzed some water droplets onto the panel using my Tim Holtz Distress Sprayer. I then stamped the butterfly and the sentiment from the Butterfly Beauty set and added some Honey Gold Nuvo Drops. For my last card, I used Fired Brick, Spiced Marmalade and Fossilized Amber. The rest of the was made using the same instructions above. You simply cannot go wrong when there is a butterfly involved! :) Look at this trio of delight. So pretty! My eye is really drawn to the first one. Love the blended colors in the background, but all are so lovely! :) Hugs! Rendered speechless...seriously! These are stunning (she says, eyeing her 'yet-to-be-used' version of this set). I. am. in. love. And inspired! Most definitely inspired!